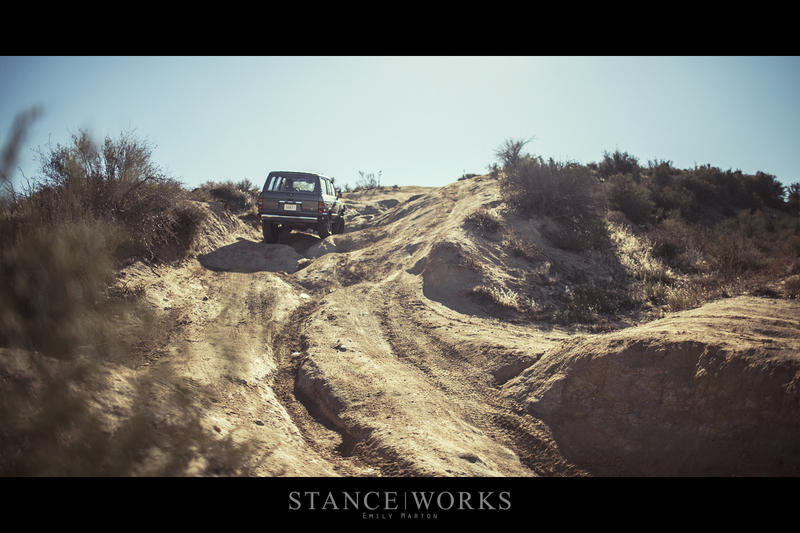 It's been several months since our last off-road excursion, with most of our attention focused on preparing Rusty Slammington for SEMA and the Essen Motor Show. However, we made a promise to ourselves some time ago that on the first available weekend, we'd hit the dirt, and on Sunday afternoon, we did just that. 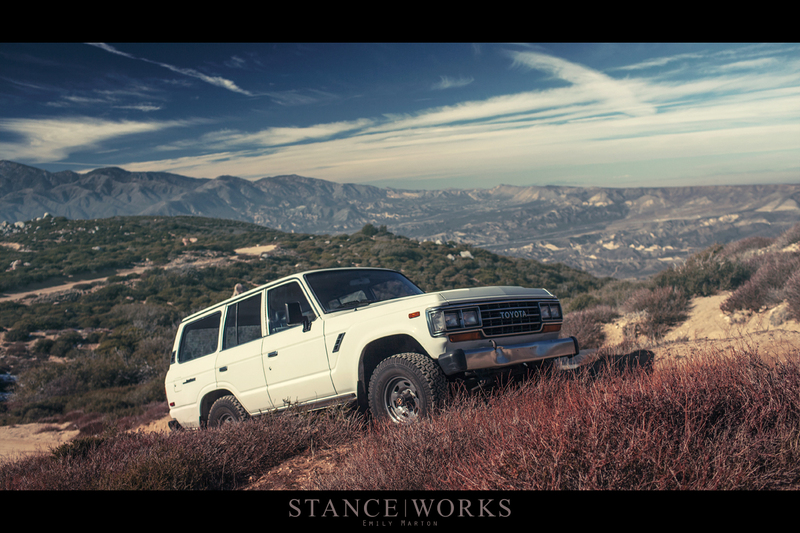 With Josh Dahlstrom's recent FJ62 purchase, as well as his and Cory Hutchison's recent move to California, the stage was set for a perfect day spent perched on the mountain side. 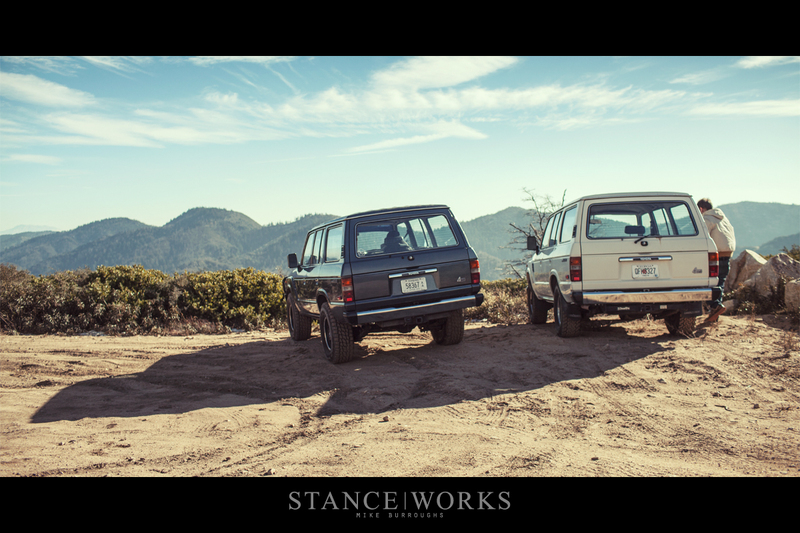 Better yet, with the recent install of ARB's Old Man Emu 3" lift kit on my own truck, the day would prove to be a perfect compare-and-contrast against the capabilities of Josh's stock Land Cruiser. 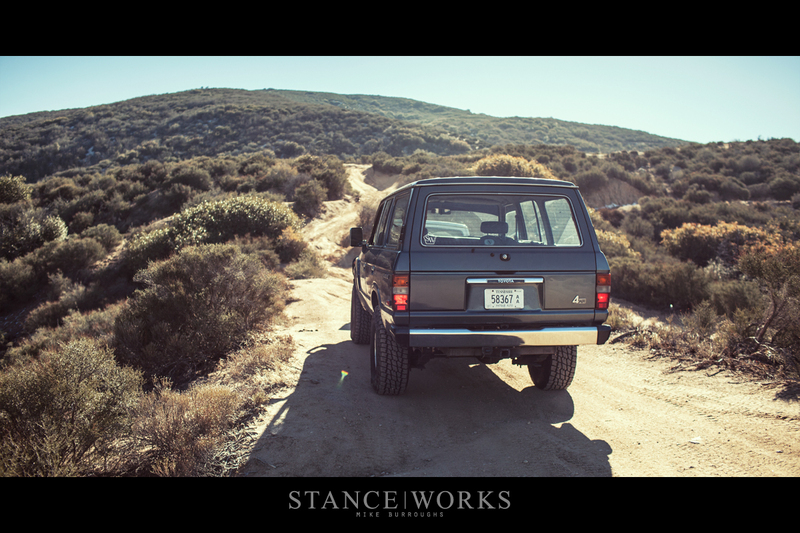 In my excitement for my Land Cruiser, I've been eager to modify it and make changes. 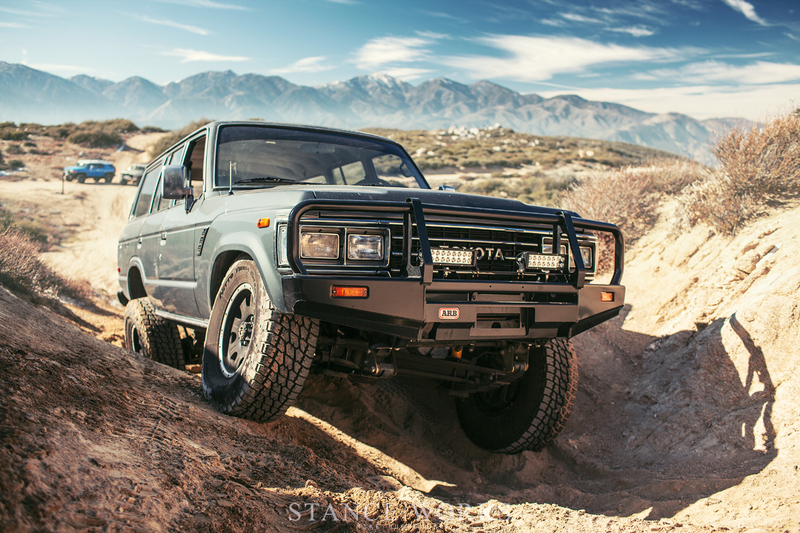 Following the Nitto Tera Grapplers, I got in touch with the folks at ARB, to see what was right for my FJ62 build. After explaining my aspirations, we agreed that Heavy Duty springs for the front and Medium Duty springs for the rear should yield ideal results. 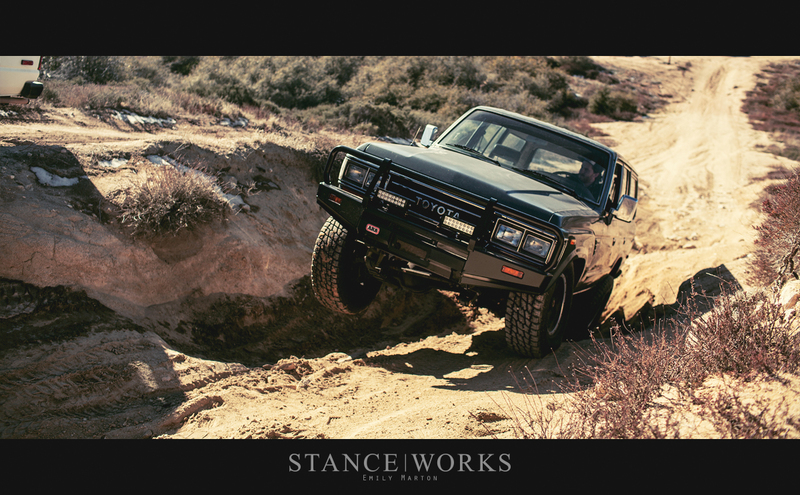 Wanting to overhaul the suspension completely, we fitted the truck with all new Old Man Emu bushings, greasable anti-inversion shackles, and "OME" Nitrocharger shocks. After the impressively simple install, it was clear that the fit, feel, and finish of the parts was perhaps better than Toyota's OEM offerings. The comfort on the street was a vast improvement, but I've been eager since the start of Autumn to take the truck out to its natural habitat. 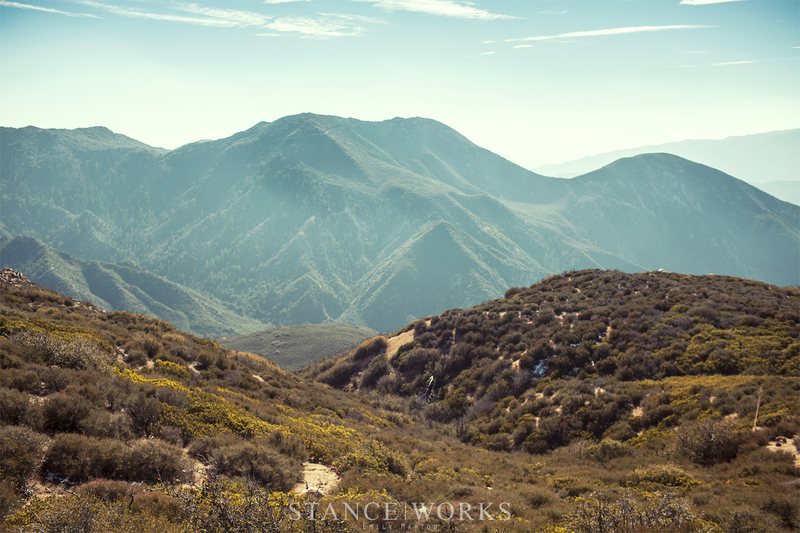 We set out for the San Bernardino mountains, and more specifically, Cleghorn Ridge, which seemed like a fitting trail for Josh's first time out on the rocks. Cleghorn Ridge is technically two trails, intertwined as they switch back-and-forth, with each segment offering a difficult side, and a modest side. Josh and Cory piloted Josh's Cruiser, while my girlfriend Emily and I set up shop in mine, with the heat on, of course. Despite the arid desert landscape, temps dropped well into the 40s, given the altitude. At the first split in the trail, we staged the trucks side-by-side. Next to each other, their difference in height and clearance is very apparent. The Old Man Emu kit offers a considerable boost to the Land Cruiser's stature, and along with that, its ability to articulate. Wanting to test the waters, Josh and I took on the first trail combination, with my truck entrenched in the more challenging half of the path. 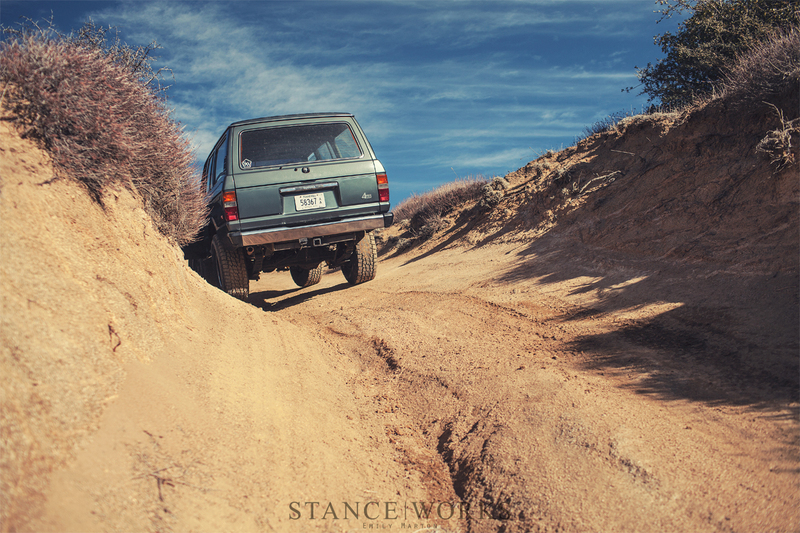 It's clear that disconnecting the swaybars is next on the list, but nevertheless, despite a bit of teetering, and after a bit of planning, the truck continued up and over the mounds. 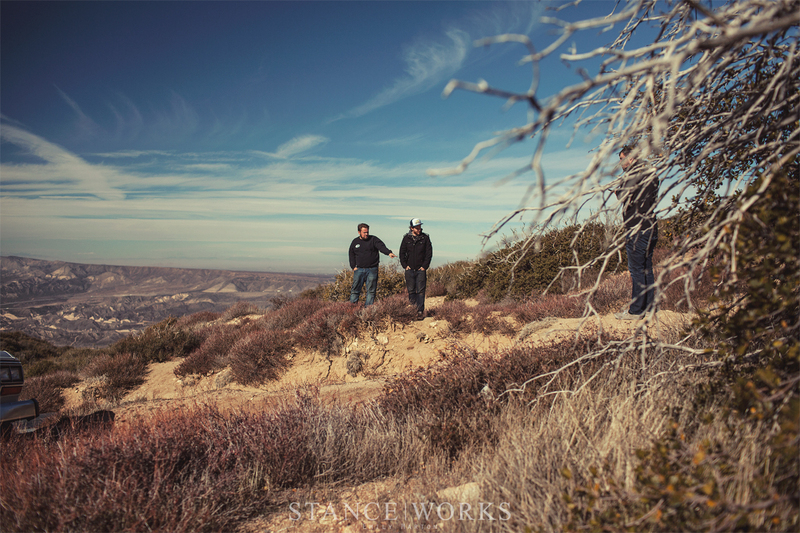 After making our way to the other side of the obstacles, we continued our climb up hill. Certain segments offered more challenge to Josh's cruiser, but we both prevailed in conquering the trails as we sought out the top of the ridge. 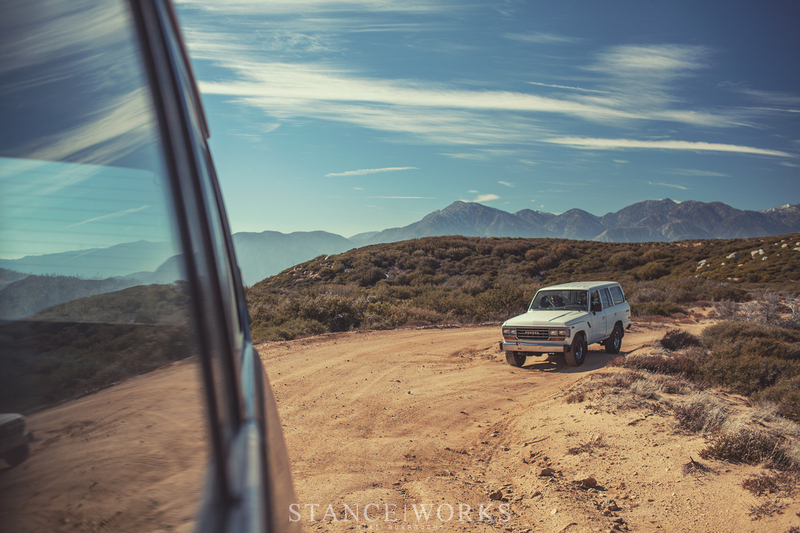 On our ascent, we passed a group of saddened souls, suffering from a broken tie rod. We offered a helping hand, hoping to drum up a workable solution to get the truck off the hillside, but in the end, we were short on materials to pull together a fix. Instead, the group was stuck, waiting for a rescue truck to arrive and haul the truck down the mountain. 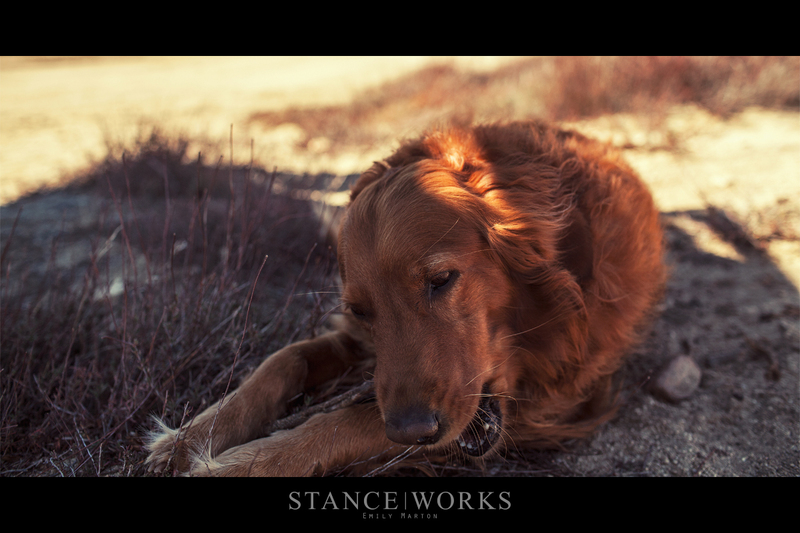 Despite the stranded group's lack of spirits, their red-haired companion, Frankie, was rather pleased with the quiet downtime. 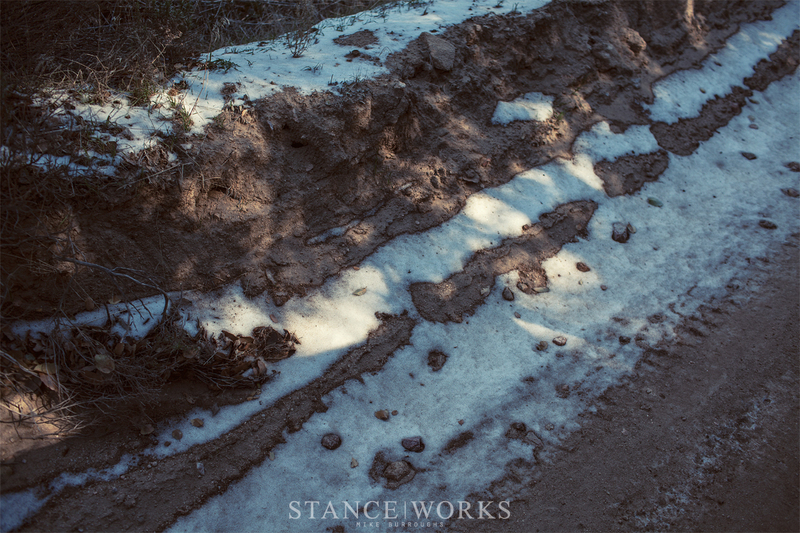 During our final leg up the mountain, we began to encounter bits of snow - a rare sight in Southern California. When the snow last fell is anyone's guess, and the only remnants clung to the hillside in the bits of shade it was dispelled to. Shortly beyond the snow, we reached a plateau, where we stopped to eat our packed lunches. Our hopes of eating outside were quickly shot down: the freezing winds were picking up, whistling as it soared around and past our trucks. 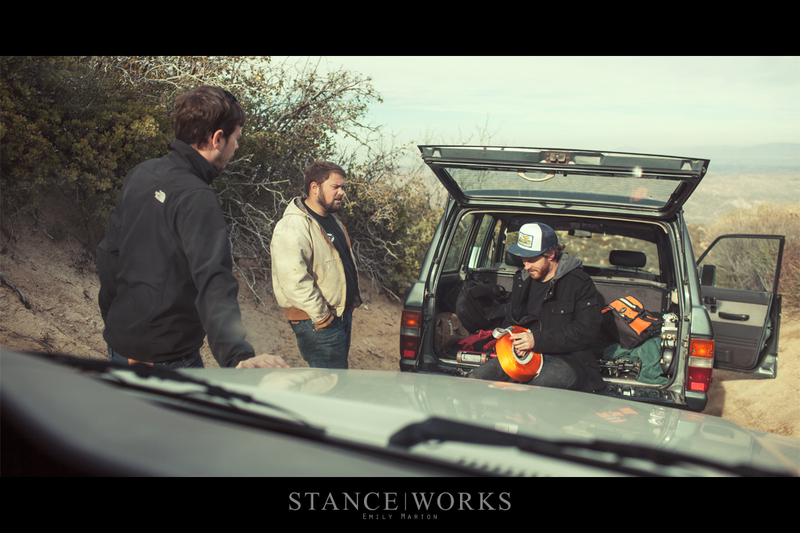 We consolidated to one truck for a short while, before heading down the far side of the mountain, towards Arrowhead Lake. The difficult side of the trail heading down is far more difficult than uphill climb. The offset angles and tough mounds we had conquered before had become deep ravines, severe drop-offs, and a stage that was simply beyond our skill level. Unfortunately, it was a realization that occurred far too late into our journey. 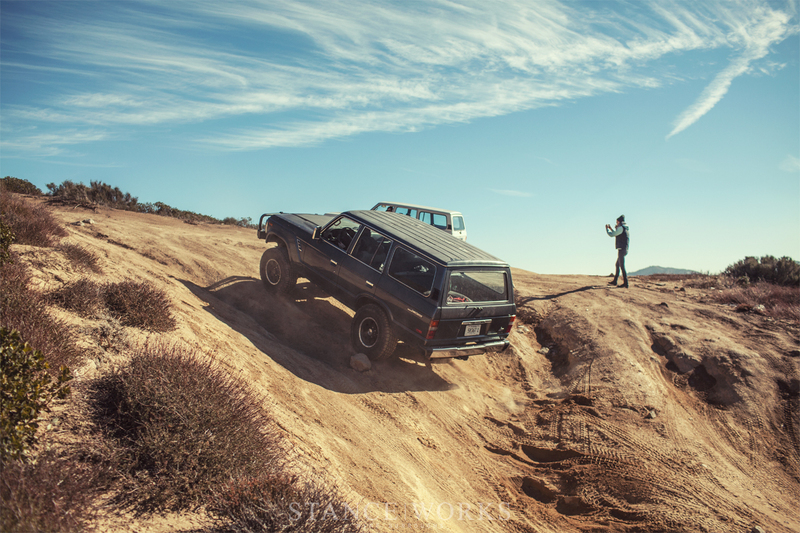 Josh's Land Cruiser was stuck attempting to enter one leg of the trail, and the steep incline behind him was prohibiting movement in either direction. Luckily for us, a Jeep-owning trailgoer with a well-equipped truck was present to winch Josh out of the trench. 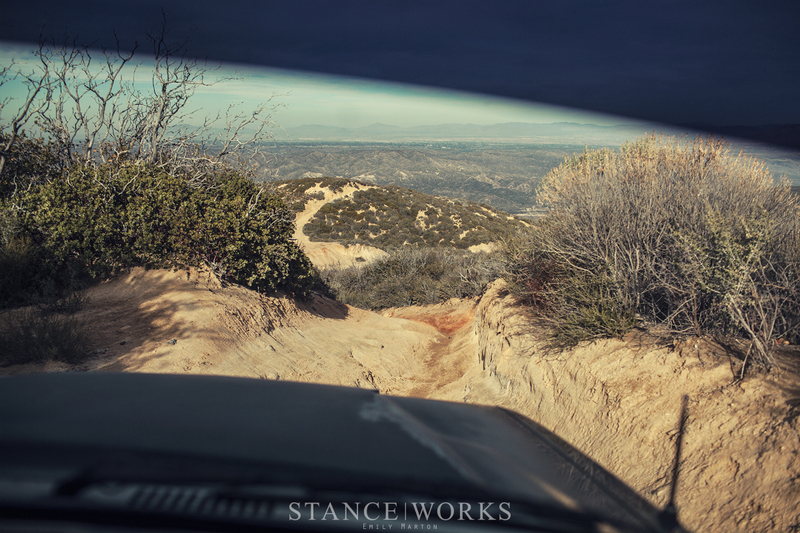 We debated carrying on with my own FJ, but we swallowed our pride, knowing that despite my truck's willingness to go, we were likely to get ourselves into more trouble as the trail progressed. We backed up the hill, with the Old Man Emu lift giving us the needed clearance to climb out without a winch. After a dicey cliffside-turn-around, we managed our way back to the safer side of the trail, trucks intact. The mishap offered a chance for us to get a bit wet behind the ears, noting that offroading isn't always a smooth, "as planned" endeavor. Nevertheless, our confidence was far from hindered, and we charged on, testing the limits of our trucks and our talents. On more than one occasion, toppling over seemed far too close for comfort, yet the trucks held on, showing that the 60-series was built to surpass our expectations. However, not making it through some of the tougher trails offered motivation to head back better prepared. After witnessing the benefits of the ARB lift kit first hand, the thought of ARB Air Lockers proves more enticing than before. Our final descent was timely, as heavy cloud cover and even heavier winds blew in. A storm was brewing, and we escaped the mountain without a minute to spare. Fortunately, being just an hour from home has its benefits, and our drive to the comfort of our warm living rooms was expressly welcomed. 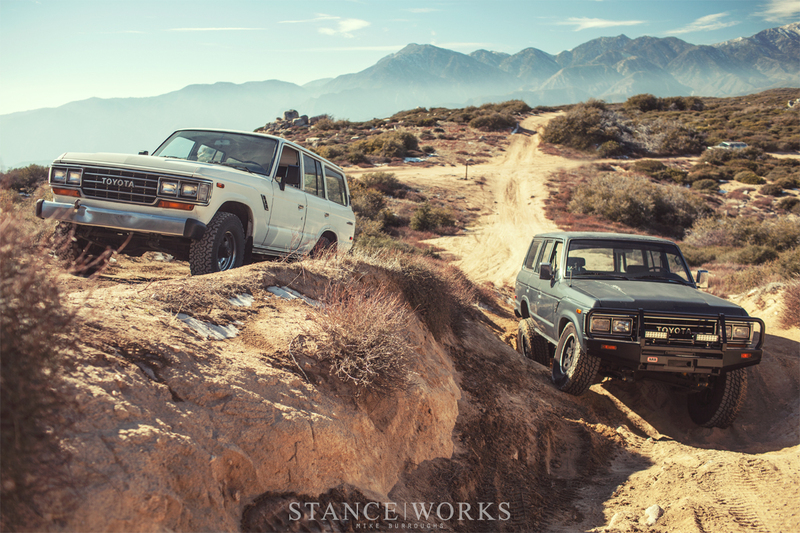 The day and its challenges made for the kind of Sunday dreams are made of, and the pair of Land Cruisers happily took every hurdle we threw their way. 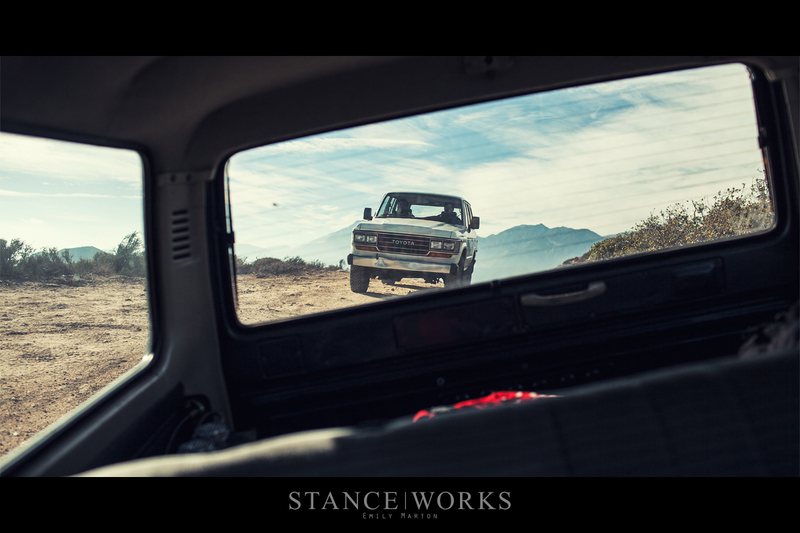 Here's hoping that we spend as much time in our trucks for many weekends to follow. not for me this stuff, I like cars a lot & driving them a lot. Going slowly, not much. any chance we can get a link to some larger wallpaper quality photos? you guys should definitely branch out into the quality 4×4 and overlanding world! 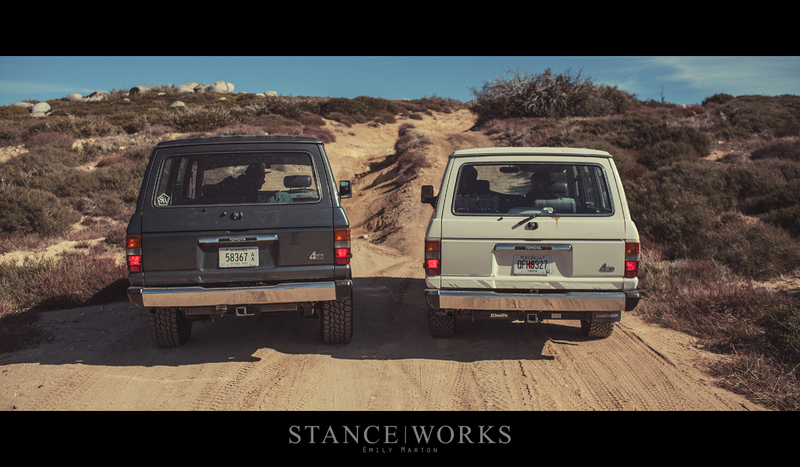 it’d be nice to change it up a bit and see some great fully functional off road stance!